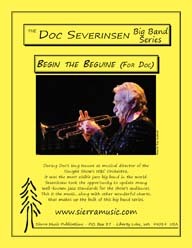 All the charts below were written for NBC's The Tonight Show with Johnny Carson Band led by Doc Severinsen. Doc originally played trumpet in the band when the show was hosted by Steve Allen and then became bandleader when Carson became the host. Charts are arranged by Bill Holman, Tommy Newsom, and John Bambridge. This great chart is recorded on the "Tonight Show Band, Volume II " CD(Amherst Records). As recorded on "Tonight Show Band, Vol. This is a remarkable chart that features tenor saxophone throughout. As recorded by the Tonight Show Band on "Once More With Feeling" (Amherst), this wonderful chart is the hottest "flag-waver" of all time. This great chart is recorded (1999) on the Azica CD "Swingin' the Blues. This wonderful Ellington classic is scored by the great Tommy Newsom to feature alto sax throughout. This great chart is recorded on the "Tonight Show Band, Volume II " CD (Amherst Records). As recorded by the Tonight Show Band on "Once More With Feeling" (Amherst), this bright, swinging chart is a blast ! Bill Holman is at his best, weaving descending unison lines with the tune stated by trumpet and tenor sax (both of which are given solo space). This great chart, a magnificent ballad feature for trumpet, is recorded on the "Tonight Show Band, Volume One " CD (Amherst Records). This wonderful, melodic Mercer Ellington tune is beautifully arranged by Tommy Newsom, and it is recorded on the Tonight Show Band CD "Once More With Feeling" (Amherst Records). Bill wrote a chart on this wonderful Stevie Wonder tune for his own band and also for the Tonight Show Band. This chart was one of the staples in the Tonight Show Band book, and they performed this often. Count Basie's great tune gets a smashing treatment from the master arranger Tommy Newsom. As recorded by the Tonight Show Band on "Once More With Feeling" (Amherst), this is one of Tommy's "classic" charts . As recorded by the Tonight Show Band on "Once More With Feeling" (Amherst), this is a lovely, warm ballad setting of this great standard tune. As recorded by the Tonight Show Band on "Once More With Feeling" (Amherst), John's arrangement (to quote Doc Severinsen), is a "masterpiece. As recorded by Doc Severinsen and the Tonight Show Band on "Volume One"(Amherst), this is a red-hot feature for two tenor saxophones (recorded by Pete Christlieb and Ernie Watts). As recorded on "Tonight Show Band, Vol. Tommy takes this old tune and turns it on its head. As recorded by the Tonight Show Band on "Once More With Feeling" (Amherst), Holman takes a fresh look at this wonderful old jazz standard. As recorded on "Tonight Show Band, Vol. This beautiful arrangement of the lovely popular Michel Legrand ballad was originally scored for the Tonight Show Band with Doc Severinsen. As recorded on "Tonight Show Band, Vol. This is recorded on the Tonight Show Band CD "Once More With Feeling" (Amherst Records). Recorded by the Tonight Show Band on "Volume One, The Tonight Show Band with Doc Severinsen," this is a great chart on a classic jazz standard. As recorded on the Tonight Show Band CD "Once More With Feeling" (Amherst Records), this chart is one of the "hippest" that Tommy ever wrote for that band. This wonderful chart is recorded on "Tonight Show Band, Vol.